UCSD professor gives TEDx Talk about why TED Talks don't work. Benjamin Bratton, a professor of art and design at UCSD, says that TED talks are misleading because they over-simplify complicated problems. 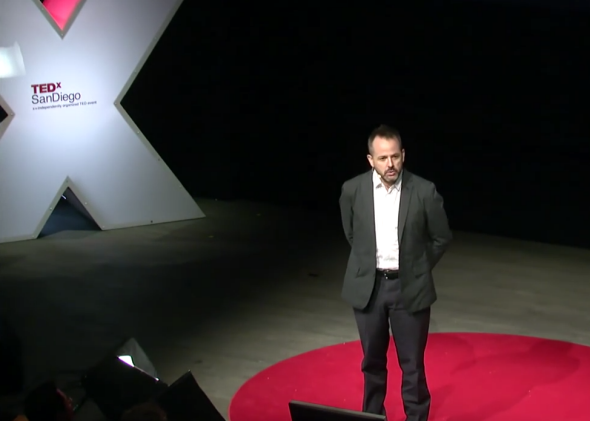 “Takes one to know one” is apparently Benjamin Bratton’s motto, because he gave a 12-minute talk at TEDxSanDiego last week explaining why TED speeches are potentially damaging to society. Bratton, a visual art professor at University of California-San Diego, says in the talk (which he also published in the Guardian) that instead of promoting his own ideas or a book, he wants to address “TED itself, what it is and why it doesn’t work.” He goes on to make some harsh comparisons and tough criticisms of TED. And he has a point. Anderson’s point is that if TED succeeds in captivating conference-goers and online viewers, then it is a valuable and worthwhile medium for distrubting information. He writes, “Can you share something worthwhile in 18 minutes? Definitively, unequivocally yes,” citing famous short speeches like the Gettysburg address and the “I Have a Dream” speech. The debate about whether TED is a valuable medium taps into broader questions about the value of rewording, and in that process often simplifying, difficult topics so lay people can understand them and participate in discussion about them. But Bratton’s point that solutions and answers to serious problems may not be available like the pieces of a puzzle is a valuable point. Probably the harshest moment is when Bratton says, “TED stands for Technology, Entertainment, Design. To me TED stands for: middlebrow megachurch infotainment.” He may be a little intense, but the dude certainly has a point of view.